About 11:00 p.m. on the night of Friday, September 3, Deputy Sheriff Bob Goode, 50, was driving his patrol car south out of Damon in Texas toward West Columbia on Highway 36. Since he had suffered a bite on his left index finger earlier that day from a baby alligator, he had asked Chief McCoy along in the event the pain flared up and interfered with his driving. It was a sparkling clear moonlit Texas night, and Goode rested his arm in the open window of the door as they drove through the prairie. Suddenly McCoy spotted a bright purple light on the horizon to the Southwest which appeared to be about five to six miles distant. At first they thought it might be something in the nearby oil fields, perhaps an oil-drilling rig. But then a blue light, smaller in diameter than the purple light, emerged from it and moved to the right before stopping. Both lights remained in this orientation for a while before beginning to drift upward. This upward floating motion continued until the objects reached an elevation of 5-10 degrees above the horizon. Goode then studied the lights through a pair of binoculars, but could not make out any additional features. As their curiosity mounted, the officers began to look for back roads that might take them closer to the lights. They stopped again, and this time the lights suddenly swooped toward them, covering the intervening distance in 1-2 seconds, abruptly stopping practically overhead. Their patrol car and the surrounding terrain were brightly illuminated in purple light. They could now see that the purple and blue lights were attached to opposite ends of an enormous object, hovering about 150 feet from them at about a 100-foot altitude. "The bulk of the object was plainly visible at this time and appeared to be triangular shaped with a bright purple light on the left end and the smaller, less bright, blue light on the right end. The bulk of the object appeared to be dark gray in color with no other distinguishing features. It appeared to be about 200 feet wide and 40-50 feet thick in the middle, tapering off toward both ends. There was no noise or any trail. The bright purple light illuminated the ground directly underneath it and the area in front of it, including the highway and the interior of our patrol car. The tall grass under the object did not appear to be disturbed. There was a bright moon out and it cast a shadow of the object on the ground immediately below it in the grass." 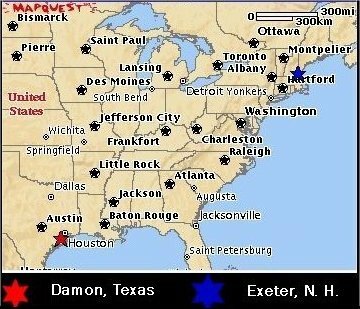 The Damon, Texas sighting took a second seat to the more celebrated Exeter, New Hampshire case which occurred on the same date... 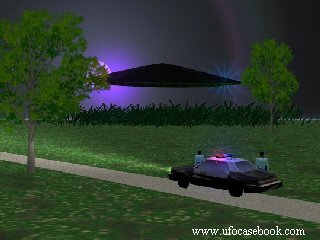 I could find no other UFO reports on this date of any note. Could the unknown objects which were seen earlier on the same day in New Hampshire have flown southwesterly down the Eastern coast of the United States, and moved over the Texas town of Damon? After a few seconds, with the strange object hovering almost directly overhead, they fled the scene and headed toward Damon "as fast as we could go," making speeds of up to 110 miles per hour. McCoy kept watching the object out the rear window of the car. For 10 to 15 seconds, the UFO continued to hover above the pasture. Then it abruptly shot back in the direction from which it had come. "After arriving at approximately its original position," McCoy reported, "it went straight up in the air and disappeared at 25-30 degrees above the horizon." Back at Damon, the shaken officers calmed themselves, and then decided to go back and investigate again. This time they drove down the Damon-West Columbia road, but saw nothing. Finally they returned to the area where they had first seen the lights, and once again spied the purple light on the horizon, and again saw the smaller blue light emerge with a strange two-step motion and float upward. Fearing another close encounter, they again fled the area. Goode and McCoy continued on their shift until three or four in the morning, then stopped for breakfast at a cafe. Goode noted that his alligator bite was no longer sore, and when he unwrapped the bandage he discovered that the swelling had gone down and that the wound was nearly healed. Next day, the wound showed virtually no scarring. The deputies reported the sighting to Ellington Air Force Base, and Major Laurence Leach, Jr., arrived on September 8, 1965, to interview McCoy and Goode and take a statement. Leach's report to Project Blue Book headquarters at Wright-Patterson Air Force Base reflected his puzzlement. US Air Force put this case in the "unknown" category. Air Force unidentified case, Project Blue Book files, National Archives. McCoy statement, Brazoria County Sheriff's Department, September 8, 1965. "Ellington [AFB] Probes UFO Seen by Local Deputies", Brazosport Facts, September 6, 1965. "The Night of the UFO", Brazosport Facts, Rhonda Moran, September 13, 1995. "The TRUE Report On Flying Saucers", TRUE magazine, 1967.